[144 Pages Report] The global workforce management market is estimated to grow from USD 4.49 billion in 2016 to USD 7.37 billion by 2021, at a Compound Annual Growth Rate (CAGR) of 10.4%. The ever-growing need workforce optimization and increase in mobile adoption is driving the growth for WFM. Increasing cloud and mobile penetration has introduced new methods of working in various sectors. The concept of real-time WFM is gaining popularity due to the increasing complexity in business activities. 2015 has been considered as the base year, while the forecast period is 2016–2021. Cloud deployment allows most of the system-based applications to run on an open and flexible architecture. Using cloud for WFM helps reduce IT administrator’s job by ensuring cost-effective and smooth workflow. With the adoption of cloud, organizations understand that it reduces the overall investments, improves implementation, gives scalability, provides easy access, and reduces complexities. Therefore, time & scheduling and absence management functions are the areas that take advantage of cloud and run according to protocols. Moreover, cloud solutions reduce the physical implementation of hardware devices to implement the solution, which is the reason for increasing number of organizations to shift to cloud-based WFM systems. Due to the aforesaid reasons, the increasing demand of cloud-based WFM solutions is driving the overall demand of the WFM market. During this research study, major players operating in Workforce Management market in various regions have been identified, and their offerings, regional presence, and distribution channels have been analyzed through in-depth discussions. Top-down and bottom-up approaches have been used to determine the overall market size. Sizes of the other individual markets have been estimated using the percentage splits obtained through secondary sources such as Hoovers, Bloomberg BusinessWeek, and Factiva, along with primary respondents. The entire procedure includes the study of the annual and financial reports of the top market players and extensive interviews with industry experts such as CEOs, VPs, directors, and marketing executives for key insights (both qualitative and quantitative) pertaining to the market. The figure below shows the breakdown of the primaries on the basis of the company type, designation, and region considered during the research study. The WFM ecosystem comprises solutions and service providers such as IBM (U.S.), Oracle (U.S.), SAP AG (Europe), KRONOS (U.S.), Workforce Software (U.S.), ADP LLC (U.S.), and WORKDAY (U.S.) among others. In January 2017, Kronos acquired Financial Management Solutions Inc., a leading provider of WFM and analytics application. This acquisition was aimed to extend Kronos’ offering for the financial services vertical. In January 2017, ADP launched ADP Professional Services for Midsized Businesses, these services will help ADP capture SMEs, by reducing their compliance and administrative issues. In January 2017, Reflexis Systems Inc. partnered with Pricer, a Swedish retail solutions provider, to integrate Pricer’s Electronic Shelf Label System and Reflexis’ StorePulse Platform, leading to optimization of operations of retail organizations, in a revolutionary manner. In December 2016, ADP expanded its operations to Norfolk, Virginia, U.S by establishing a new service and implementation facility. It will be one of the largest ADP facilities in the U.S.
What are new industry vertical which the WFM companies are exploring? The workforce management market is expected to grow from USD 4.49 billion in 2016 to USD 7.37 billion by 2021, at a Compound Annual Growth Rate (CAGR) of 10.4% during the forecast period. 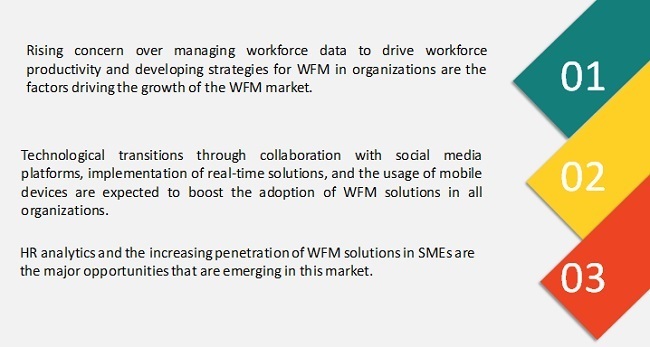 Factors such as the increasing demand for workforce optimization and increase in mobile applications driven by the emergence of digital technologies and workforce analytics are driving the WFM market. Adoption of these Verticals such as healthcare, banking, defense, and telecom & IT have boosted the market. In past decades, WFM dealt with finding the right person for the right job at the right time and organizations were heavily focused on scheduling these employees as and when they were needed. It was only about forecasting the actual results and setting up the early warning systems to identify the demands and required changes. Gradually, it started gaining importance due to expansions in the working sector and changing Human Resource (HR) activities. Therefore, WFM solutions started providing organizations with better forecasting and scheduling plans, acquiring real-time information, and planning & managing information effectively for better business plans. These software solutions were used for time and attendance management, compensation management, and performance management. 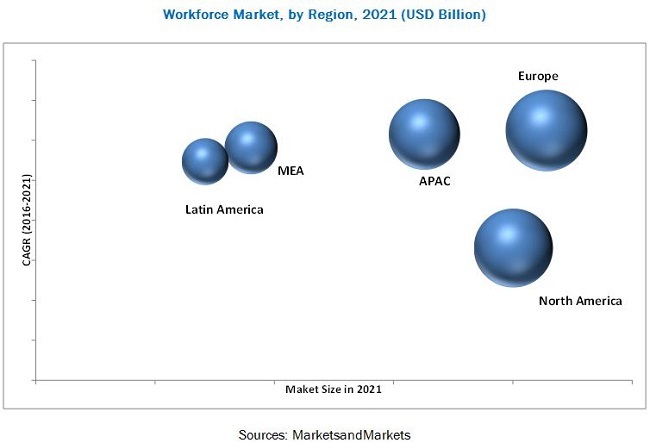 The Workforce Management market is segmented by component (solutions and services), deployment type, organization size, industry vertical, and region. The services segment is expected to grow at the highest CAGR owing to an increasing number of organizations outsourcing their IT operations to third-party vendors. The global market has been segmented on the basis of regions into North America, Europe, Asia-Pacific (APAC), Middle East and Africa (MEA), and Latin America to provide a region-specific analysis in the report. Europe is expected to have the largest market share. In Europe, countries such as the U.K. and Germany are accepting and implementing changes in WFM. Compared to other regions, European companies, both private and public, are constantly facing challenges like budget constraints and high competition. They, therefore, require better software and solutions to maximize the efficiency of their workforce. The deployment of cloud is also a driving factor in Europe for the rapid adoption of workforce analytics. The consumer goods & retail vertical is evolving and is expected to change rapidly in terms of technology deployment, customer needs, and employment patterns. Retailers need to gain more visibility and control over a diversified and mixed workforce, composed of in-store employees, drivers, and field service providers, both internally and externally. With such complexities, the retail sector needs to focus on employee selection and training, time & attendance, labor analytics, forecasting, and scheduling optimization. WFM solutions help solve these complexities by proper utilization of resources through the power of big data and also provides mobile solutions for budgeting, forecasting, and managing employee tasks. The healthcare sector is a rapidly growing market for WFM solutions due to its need for critical manpower management. The healthcare vertical is heavily dependent on its manpower resources for critical activities; thus, adopting WFM solutions to plan and execute its operational activities can be extremely beneficial for it. The healthcare sector requires WFM solutions for employee management and scheduling the time for patient-related activities. Moreover, healthcare faces other complexities such as nursing rotation, staff timing and deployment, data entry, patient procedure cost, and record keeping, which is difficult to maintain. The transportation & logistics vertical comprises various areas such as transportation, warehousing, couriers, real estate, outsourcing companies, and travel agencies. Companies such as Kronos and Workforce Software offer workforce related solutions, including labor management, to various service-based companies for their specific needs. The transportation & logistics vertical is highly diversified in terms of workforce, and the skill and functionality needed are different from one department to another, thereby making it difficult to manage the workforce. What are the upcoming industry verticals for WFM? The primary reasons behind the adoption of WFM solutions is the need to optimize workforce and the rapid increase in mobile applications. These solutions help organizations bring transparency into Human Resources (HR) operations and processes and hence improve their decision-making abilities by understanding the role of human capital in the organization. The rise of cloud deployment is another driver for implementing remote workforce solutions, but the lack of awareness of workforce tools and solutions promotes the use of traditional management methods. The WFM ecosystem comprises of solutions and service providers such as IBM (U.S.), Oracle (U.S.), SAP AG (Europe), KRONOS (U.S.), Workforce Software (U.S.), ADP, LLC (U.S.), and WORKDAY (U.S.) among others; who offer their software, solution and services to end users to cater to their unique business requirements. These players are increasingly undertaking mergers and acquisitions, and product launches to develop and introduce new technologies and products in the market. 15.6 Automatic Data Processing (ADP), LLC. 15.7 Ultimate Software Group, Inc.
*Details on Business Overview, Solutions and Services Offered, Recent Developments, MnM View, Key Strategies, and SWOT Analysis might not be captured in case of unlisted companies. 15.12.2 Huntington Business Systems (HBS), Inc.